Product prices and availability are accurate as of 2019-04-14 18:39:01 EDT and are subject to change. Any price and availability information displayed on http://www.amazon.com/ at the time of purchase will apply to the purchase of this product. 40 Amp 4x 3 Pole 400 VAC Contactors - NO OPEN Contacts Energy saving low power drain, electrically held lighting contactor. 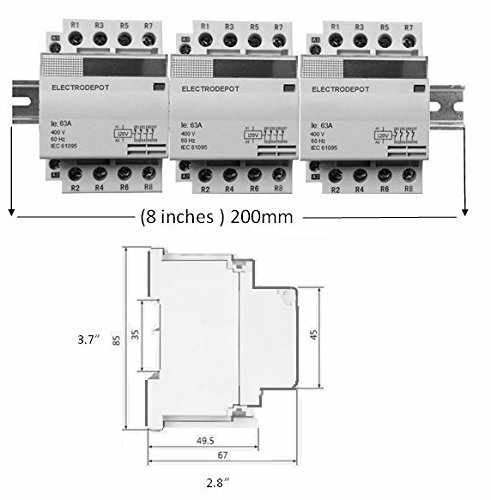 FEATURES DIN rail mounting 60A. Incandescent or resistive load, 32 A. Ballast and General purpose Power ON indicator Coil: 62VA inrush, 12VA sealed. IEC AC Rate: AC-1; 16 kW, AC-3; 11 kW @400V Operating Temperature -30...+70 °C (-22...+158 °F) Solid Conductor: 25 mm2 Max torque 0.6 Nm Stranding Conductor: 16 mm2, Max torque 0.6 Nm, - Electric strength: 4 kV Max switching capacity 600 switch/hr. low humming coil, low noise CE approved 61095, Weight: 0.88 lb (0.42 kg) Each.